Today, Sept. 14, Mayor Sylvester Turner has appointed Marvin Odom, retired chairman and president of Shell Oil Company, to be chief recovery officer of Harvey relief efforts. 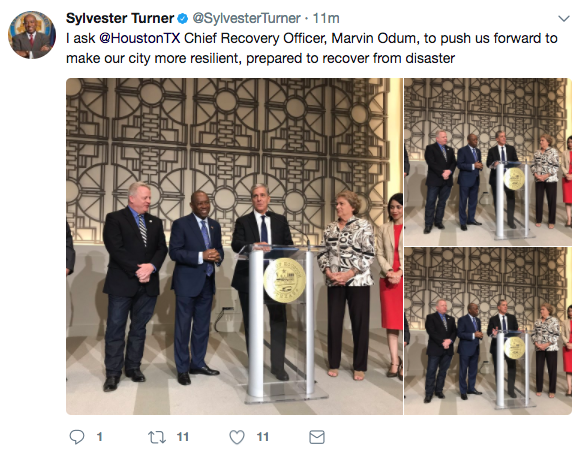 “[Odom] has been a global leader in the oil and gas and power generation industries, and has extensive experience in large scale crisis management,” Mayor Turner said in the press conference. The storm flooded and displaced thousands of people, and while discussion about the “public sector” is mentioned in the press conference along with projects on “how to make the city more resilient” the undertones of this appointment is clear the focus is on rebuilding the businesses. “The city still needs to run on a day to day basis, move forward, we still need to compete to get Amazon here,” Mayor Turner said after Odom finished talking. Towards the end of the press conference, Mayor Turner elaborated on how low-income areas continue to be built in areas that repeatedly flood and this is a problem that needs to be fixed. However, that was a topic touched on towards the end when the impact of the storm on Houston communities probably should have been at the forefront of the conversation. When the Mayor keeps saying “people are losing focus” or “people need to know to look up to” in the press conference, which people is he talking about? The communities that have suffered, or the oil and gas companies that power the city? Odum had been with Shell Oil for 34 years before retiring. As Houston moves forward with recovery efforts, the people will begin to have a clearer understanding of their relationship with their local government and corporations. Originally published at truthagainstthemachine.com on September 14, 2017.